How do I subscribe to a bug? Sometimes people tell me to subscribe to a Launchpad bug so I can follow along it's progress, how do I do this? Launchpad uses notification emails and Atom feeds to help you stay on top of the bugs that interest you. project or package bug supervisor. from Launchpad's Bug Subscriptions help. First you will need to log in to Launchpad. If you don't already have a user account, you will need to create one. The Launchpad documentation has instructions on how to set up a user account using OpenID. Next you have to find your Bug. To do this, first find the product that the bug is associated with. Launchpad provides projecte management for many more projects other than Ubuntu. 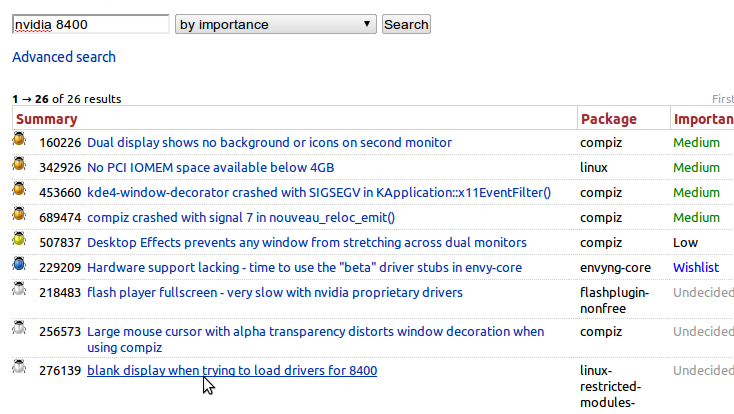 When you've found the correct projects, visit it's Bug Tracker by clicking Bugs in the top navigation bar. And find the bug you're interested in. Use the search function, and have a good look through all of the results. Sometimes, a bug's title can be a bit confusing. So make sure you've got the right one(s). When you've found the correct bug, open it up and read it. 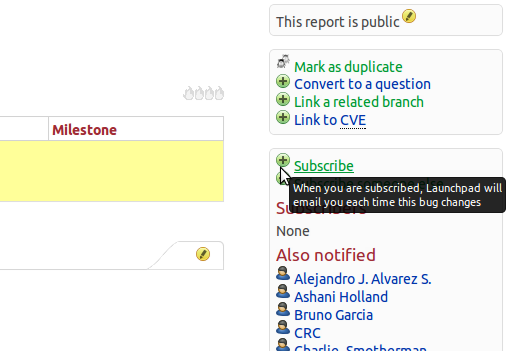 You will get an indication as to the status of the bug. You can see the importance of this bug is undecided. But it has been confirmed to be a real bug. You also get an indication which package in Ubuntu the bug is related to. Sometimes, there are more than one. You can unsubscribe in the same way. · Incomplete: the bug report is incomplete and needs more information before it can be triaged. Bugs in this state are considered for expiry. · Invalid: the report describes the software's normal behaviour, or is unsuitable for any other reason. · Confirmed: a member of the community other than the original reporter believes that this report describes a genuine bug in enough detail that a developer could start work on a fix. · In Progress: a developer has taken responsibility to fix the bug and has begun work. · Fix Committed: a developer has committed his/her fix to the project's codebase. · Fix Released: a new version of the software, featuring the bug fix, has been released. This alone will not subscribe you to the bug. But it will let the Bug Tracker, and the developers, know that you are affected. The number of people affected is an indication as to how important this bug is. You can also subscribe to a bugs Atom Feed, using your favourite feed reader. Not the answer you're looking for? Browse other questions tagged launchpad bug-reporting or ask your own question. How do I add myself to bug report? How to make the lock screen look like the login screen? How to add my favorite places as a quicklist in my home's icon in Unity? How to remove duplicate tracks from Banshee? Where do I place a logout script for LightDM? When will Octave 3.6.1 be available to be installed? How can I best retest a bug in a newer or development release? How do I assign a Launchpad bug to an external tracker? How do I subscribe to a tag in launchpad? How do I subscribe a launchpad.net team to all bugs that have a specific tag in a specific project? Is it acceptable to subscribe someone else to a bug report? How do I unsubscribe from a Launchpad bug?